After eating, we went back to the hotel briefly to prepare for a day out. We walked west from our hotel to the pedestrian bridge passerelle du Palais de Justice over the Saône river, intending to cross it into the old city, Vieux Lyon, on the west bank. But when we got to the bridge, we found a large food market set up along the east bank of the river, extending both north and south. This was the Marché Saint-Antoine. The fresh produce was irresistible, so we walked first north, then doubled back and headed south the full length of the market, which was considerable. 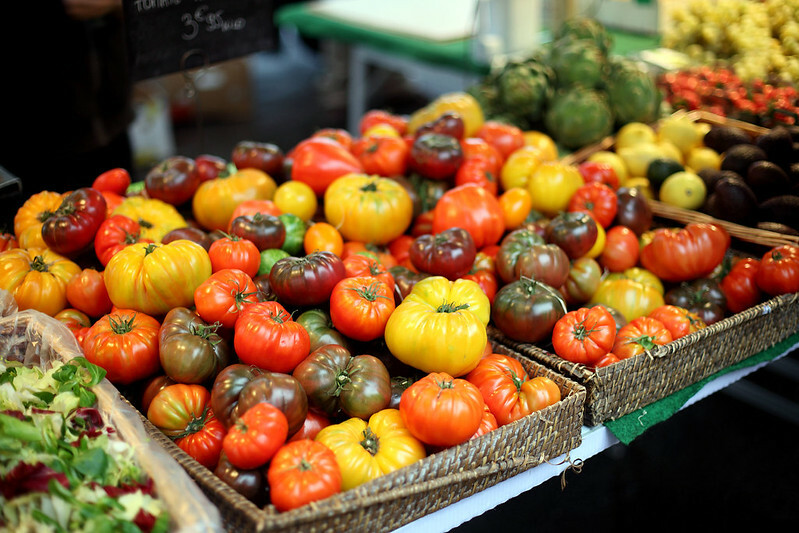 There were fresh fruits and vegetables of all descriptions, as well as mushrooms, nuts, olives, dried fruit, fresh meat and seafood, sausages and other processed meats, eggs, bread, pastries, tarts, cakes, biscuits, and cheeses. In particular there was a lot of goat’s cheese, much of it in small cylinders, not much more than bite sized, while others were in rounds like small bries. There was also hot food as well, with a few stalls roasting chickens on multiple rotisseries, with the fat dripping down into a tray at the bottom where potatoes were cooking. Others had hot sausages, or various foreign food such as samosas, kebabs, and paella. And besides all this food, there were also several flower sellers with dozens of colourful fresh cut flowers. One lady at a bakery stall explained that the pink things we were seeing everywhere were a Lyon specialty, with the pink praline paste being sugar and almonds, and this was used on everything from tarts to biscuits to brioche. We stopped at another stall to buy a couple of apples to eat later in the day. M. got a red one while I chose a green one, placing them in a metal pan that the stall owner gave us to make our selection. After walking the length of the market, we ended up at the south end, near the pont Bonaparte, so we crossed that instead of the pedestrian bridge we’d intended to take. Heading inland a little way, we turned right and found ourselves in Place Saint-Jean, in front of the Cathedrale Saint-Jean. 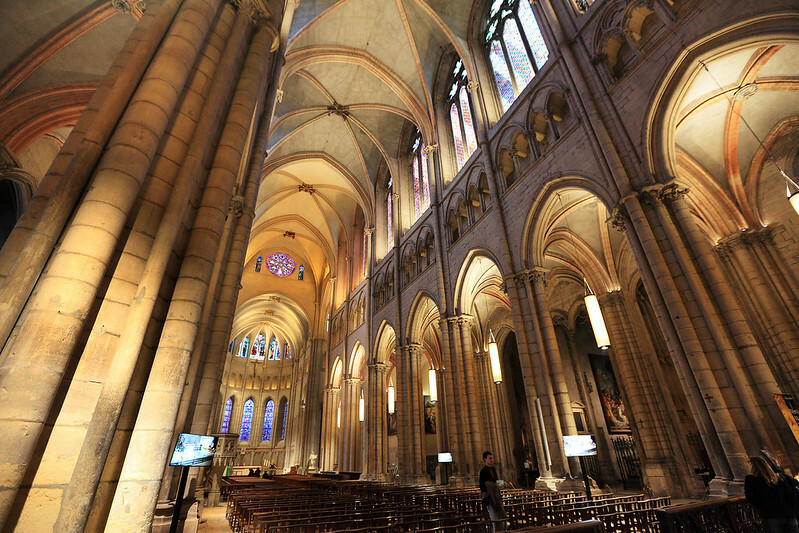 This is a large squarish looking cathedral, made of a pale, almost white stone. We went inside to have a look and then began heading north along Rue Saint-Jean, which is a narrow cobbled street, off limits to vehicles, and lined with numerous restaurants and shops in the old Renaissance era buildings. Even early in the morning, before much was open for the day, it was full of tourists. We walked up the street most of the way, stopping to enter one of the historic traboules to have a look. These are passages through buildings to connect the streets on either side, as there are very few connecting streets crossing between the long streets that run parallel to the river. 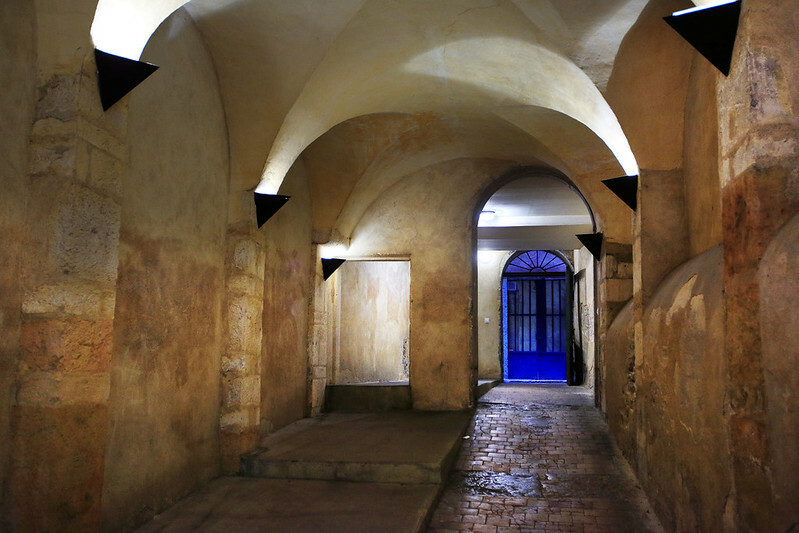 The traboules are really entrances to apartments, and the passages often pass through a small interior courtyard, where you can look up to the apartment windows above, opening into a well looking down to the courtyard. On one or more sides of the well is often a semi-enclosed spiral staircase, in a round tower with cut away windows. The architecture of these is old and very interesting. These traboules don’t seem to be particularly well known, with most of the tourists just ignoring them, probably not even knowing they are there. Because from outside they just look like residential apartment doors, and you have to know where the publicly accessible ones are, and press a button to open the latched door and get in. At the northern end of the shops on Rue Saint-Jean, we turned back and then headed inland again away from the river bank to Rue du Boeuf, another similar historical street, though with fewer shops and restaurants on it. 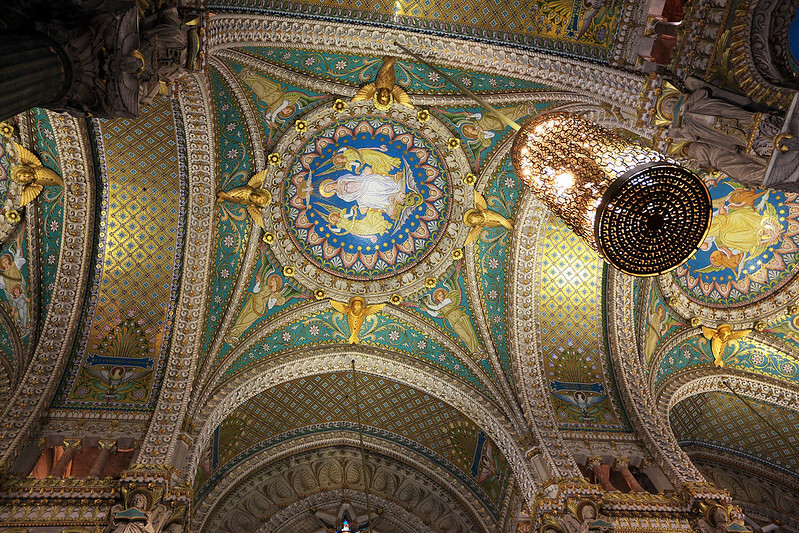 This led us to the Montée des Chazeaux, which is a long and steep staircase leading up the hill towards the Basilica Notre Dame de Fourvière, named after the Fourvière hill. These stairs didn’t take us all the way though! We had to walk up a steeply sloping street, then found some more stairs leading through a tunnel to a point where we could begin walking up the sloped paths that switchbacked through a forested garden. The trees were just beginning to turn colour and drop their leaves, so it was a pretty walk, but exhausting for the legs. Reaching the bottom edge of the basilica, perched right on the edge of the hilltop, we entered a lower entrance on one side, which led into a large crypt, so large that at first we thought it might be the main interior space, but we realised it was the crypt when we spotted stairs leading upwards from the side. This led us to further small chapels, and finally another set of stairs leading up to the main service area, but this was currently closed with a sign saying there was a mass in progress. A man tried to enter, but another man came out to shoo people away. So we went outside and examined the exterior of the basilica, which was gleaming white stone similar to the Cathedrale Saint-Jean, visible way down at the foot of the hill below us. M. checked out the adjacent basilica shop, while I admired the view over Lyon and took some photos, until she joined me. Then we decided to walk over to the nearby Roman amphitheatre, the Ancient Theatre of Fourvière, just a few hundred metres away. 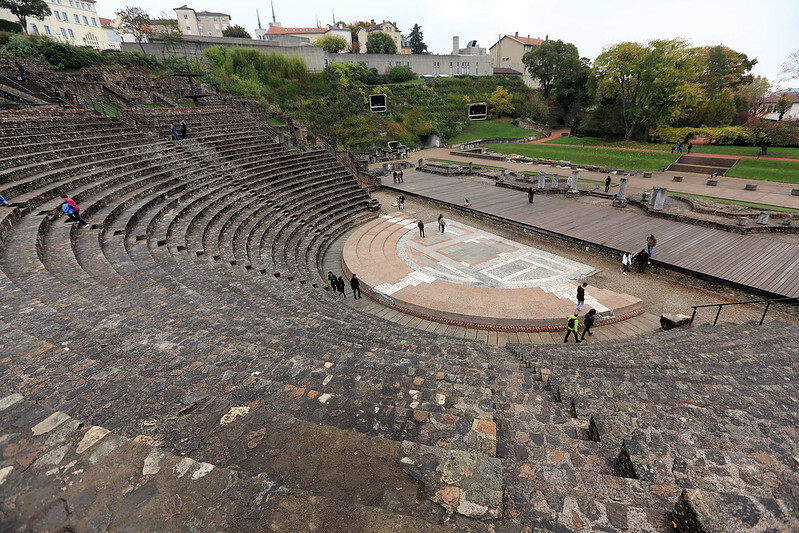 This was in a spectacular area of ruins, with two theatres of different sizes, the Ancient Theatre itself plus the Odeon of Lyon, plus several Roman buildings adjacent to them, all set in a bowl at the top of the hill with spectacular views over the city below. The larger theatre had been renovated somewhat with a modern stage and fittings for lighting and audio gear, obviously for performances still held here. Several visitors were clambering all over the site, examining the ruins, and we joined them for a close look, climbing down the large seating semicircle to the stage area then back up again, looking at various stone building blocks, columns, and decorations along the way. After examining the Roman constructions, we headed back to the Basilica to see if the mass had finished. This time we entered the main doors at the front, rather than via the interior antechamber on the side by the crypt. There were quite a few other tourists also entering to look, but the mass was still in progress and there was a man at the back hushing the gawkers and stopping people from taking photos. The interior was beautifully decorated, so it was a shame we couldn’t walk around and take pictures. But as we looked the priest began the communion part of the service, so we exited with the intent to come back in soon after the service had ended. We walked to the northern side of the Basilica where there was a large open terrace overlooking the city below, and a fast food kiosk and a souvenir shop. I used the toilets here, while M. checked the souvenir shop. After a while we went back into the Basilica, where the communion was just ending. We waited until the service ended and people started filing out. Then the barriers were removed and the tourists could wander freely and take photos. We did a circuit of the large space, photographing the amazing gilded wall paintings and ceiling, and the stained glass windows and other decorations. After touring the Basilica it was a bit after noon, so we began the walk back down the hill to Vieux Lyon to get some lunch. 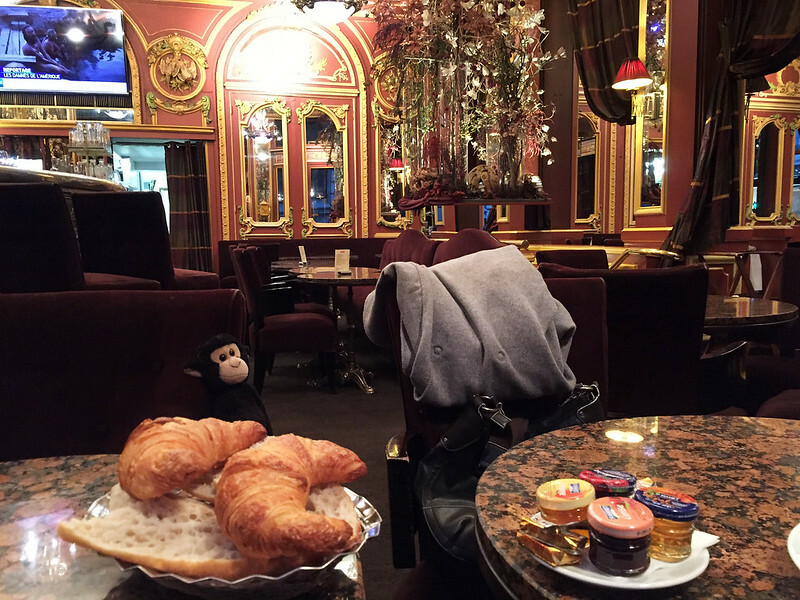 We went back to a bakery on Rue Saint-Jean that we’d seen earlier that looked good, the Boulangerie du Palais. There was a queue of people outside waiting to buy things, which seemed a good sign. 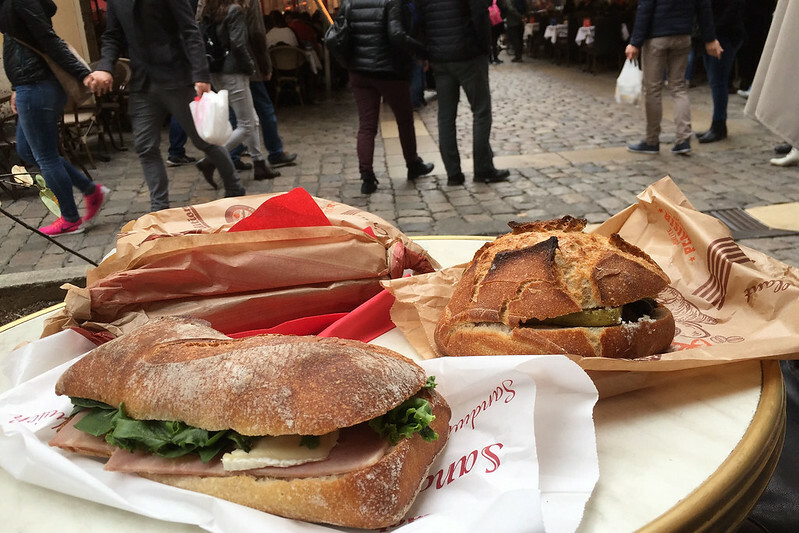 They had several different types of sandwiches on freshly baked bread rolls, but looking at the French menu it wasn’t clear of any were vegetarian. So when I got to the front of the queue I asked for a jambon, brie, et figues for myself, and then asked if they had any vegetarian ones. The lady said yes, there was one with aubergine and some other things, so I got one of those for M. I also got us some sweets, since the bakery had several good looking things on offer. M. wanted a croquant du praline, a sort of biscotti slice with the pink almond stuff we were seeing everywhere, and I got a slice of a praline galette, which was a large slice from a giant pizza sized tart covered in the pink praline mixture. We got seats at a small table in front of the bakery, which M. guarded while I waited in the queue. The sandwiches were good, with the bread really crusty. M.’s had eggplant, pickles, olive paste, sun dried tomatoes, lettuce, and goat’s cheese. As we ate, small sparrows flitted around very close, picking up crumbs off tables and the ground. Moving onto the dessert, the galette had a thick crust which was soft and light, so despite its size it wasn’t overly filling. M.’s croquant on the other hand was dense and chewy, with whole hazelnuts as well as the pink almond praline. She ate about a third, and gave me a sample, and then wrapped up the rest for later (though ate it soon after as we walked through the streets). 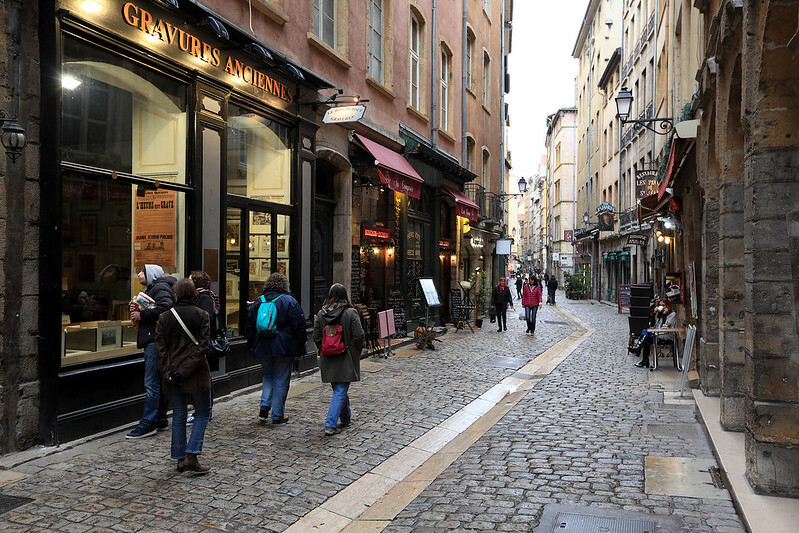 We wandered the streets of Vieux Lyon a bit more, finding a few more traboules to walk through and check out. We went onto a comic shop, which had hundreds of French comics in the styles of Tintin or Asterix, with names I’d never heard of. There were a couple of sweets shops, decorated for Halloween, oddly both different shops having a pirate theme as their standard branding. The streets were getting pretty crowded with tourists now, even though it’s not peak tourist season. There were stalls making crepes and waffles, and a fairy floss stand, and a few gelaterie and other fun food places. One creperie had a large soup warmer going with a sign on it saying “Vin chaud, delicieux!” For €2, I tried a cup. As the man ladled some into a plastic cup for me, the heady aromas of alcohol and spices wafted over. The red wine was mulled with cinnamon and other things, and was hot and indeed delicieux. We walked south to the Saint Georges area, where we passed a restaurant called La Mouss’tache, which a search earlier had indicated had a vegetarian friendly menu, with a potato rosti burger. It was supposed to be open from midday, but looked resolutely closed when we passed, so we couldn’t have a look inside or book a table for dinner. M. decided we might be better off just going to the same street as last night anyway. We passed the Church of Saint George and headed back to the river to cross at another pedestrian bridge, south of the Pont Bonaparte. Back in Presqu’îsle, we walked over to the Place Bellecour, which is apparently the largest open square in all of Europe. Our map said the corner where we entered held a statue of Antoine de Saint-Exupéry, but despite looking we couldn’t find it. We walked diagonally across the enormous empty square, passing the equestrian statue of King Louis XIV in the middle. From here we walked over to the other street that the hotel receptionist had told us had a bunch of restaurants, Rue des Marronniers. This was smaller and less interesting than Rue Mercière, but it held the amusing restaurant named Chez Fyfy, an overtly French sounding name, but which advertised “Japonais, Sushi, Ramen”. We walked up a pedestrian plaza to Place de la République to take a quick look at that, then went back across to our hotel to freshen up a bit before dinner. After a brief rest, we emerged in the late afternoon, intending to walk around a bit more and take some twilight photos with my tripod before getting dinner. With sunset at 17:30 and the sky completely overcast, the light grew dim quickly. We walked north to the Hôtel de Ville, the city’s town hall building, an impressive piece of French revolutionary architecture with gold trim on the roof. Behind it was the opera house, which was an interesting blend of an old stone building with very modern renovations and a gleaming new glass section poking out of the roof. From here we walked over to the Rhône river bank, getting our view of Lyon’s second river for the first time. It was wider and more impressive than the Saône. After a few blocks walking south along the river, we reached the Hard Rock Cafe, where M. wanted to look and check out the souvenir shop. Despite it being about 18:30, the restaurant and bar area seemed completely closed for business, with staff just getting ready for the evening. The gift shop area was small, but M. found a shirt she liked and bought it. View across the Saône River towards Vieux Lyon and the Basilique Notre Dame de Fourvière. 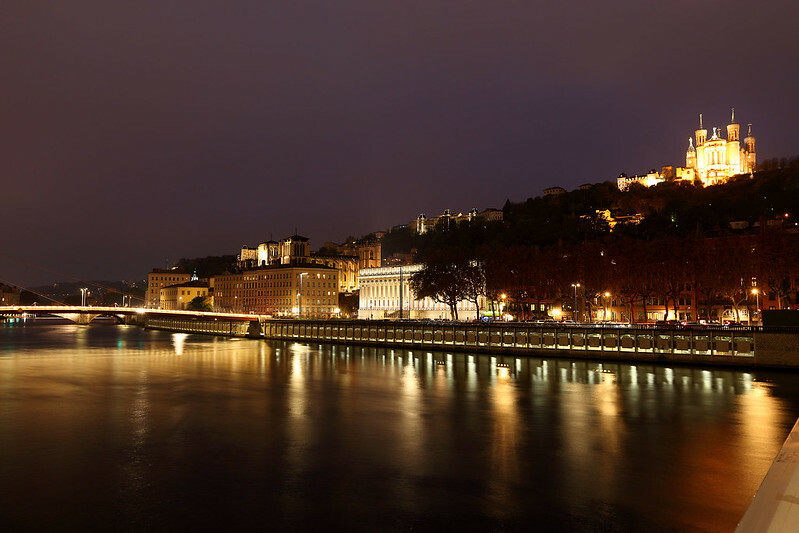 We crossed the Presqu’îsle peninsula between the rivers and then back across the Saône to Vieux Lyon, taking some tripod shots of the lights on the river and the Basilica high on the hill above as we went. 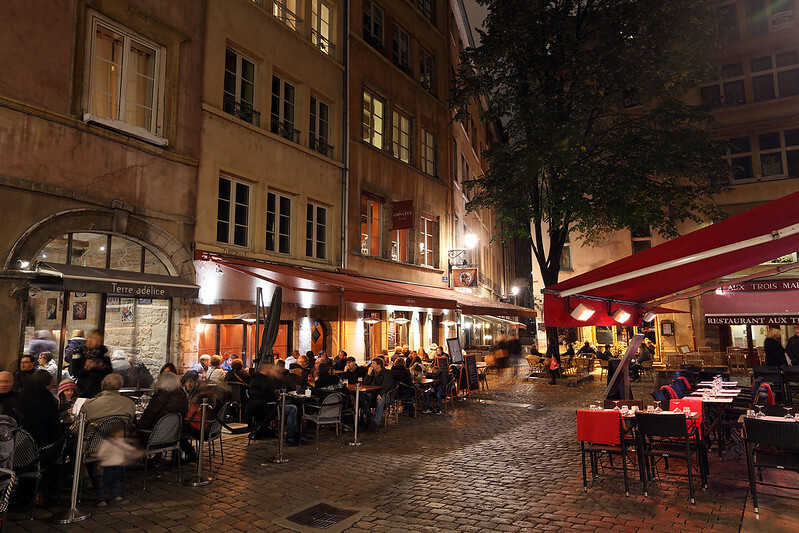 We walked down Rue Saint-Jean again, this time in the evening twilight, taking photos of the picturesque street and lighting, with lots of people sitting outside at restaurants and bars. We decided to drop our things back at the hotel before going to dinner in Rue Mercière, so crossed back over the pedestrian bridge passerelle du Palais de Justice. This bridge was unfortunately too unstable to take tripod photos from, shaking noticeably with the footsteps of people walking across it. After dropping my camera gear and M.’s Hard Rock purchase at the hotel we walked back to the restaurant strip. One place we’d attempted to get into last night with some vege options on the menu was called Le Winch, and this time when we entered a man pointed us at a small table by the front door, with two seats next to each other with backs to the wall. This was a good position for watching people walking by outside, but we got a blast of cold air every time someone opened the door. It wasn’t too bad though. One item on the menu was “Camembert rôti”, which it described as coming with potatoes, ham, and a salad. I assumed this was a rosti, with the French spelling habit of dropping the “s”, and would be a mainly potato dish with some cheese in it, like the Swiss rosti. I told the waiter M. was vegetarian and asked if she could have it without the ham, which was fine. I ordered a “mixed grill du poissons” which was skewers of salmon, scallops, and giant prawns, served with salad and chips. I got a glass of Viognier, while M. chose a glass of some sort of red wine identified only by the vineyard. The wines arrived. My Viognier was a typical example of that varietal. M. said her red wine had a slightly sour flavour, like cherries, but was nice. And then the food arrived. Mine had two skewers, one with scallops and another with a big chunk of salmon. There were two enormous prawns, but not on skewers. And there were waffle shaped potato chips and a salad of green leaves with a drizzle of a creamy dressing. There was also a dollop of a sauce, a bit like tartare, but with mustard seeds in it. I had some on the various seafood and it was good. M.’s dish was a bit of a surprise. Apparently the “rôti” didn’t mean rosti at all, but rather “roasted”. Her plate had a pile of fried potato wedges, the same sort of salad as mine, and a shallow ceramic baking dish containing a whole round of Camembert, which had been scored with an X on the top and then baked until it melted. These dishes came with a basket of fresh bread, sliced thick. M. ate her potatoes and then used a knife to spread the melted cheese onto the bread. It was a rich dinner, and I tried a couple of pieces of the hot cheese as well, which was delicious on the crusty bread. While we ate, people kept coming in to see if tables were available. Many were turned away, but occasionally some other diners would finish and leave, and then the next people to enter were lucky and got their table, sometimes just a minute after someone else had gone away disappointed. Perhaps we’d been one of the lucky ones too when we arrived! After dinner we walked back to our hotel, where we showered and prepared for bed after a busy first day! This entry was posted on Saturday, 24 December, 2016 at 19:02	and is filed under Diary. You can follow any responses to this entry through the RSS 2.0 feed. You can skip to the end and leave a response. Pinging is currently not allowed.